When I was pregnant, I came across The Wise Baby blog and it quickly became my go to spot for baby product reviews and recommendations. Recently, I came across their "Baby Registry Breakdown" and thought, "Wow. I really wish I had seen this sooner!" Ha ha! After being a mom for almost four month's now, I feel I can confidently say that this list sums up your baby needs and wants quite nicely - and gives you some great recommendations for specific products that are popular right now. 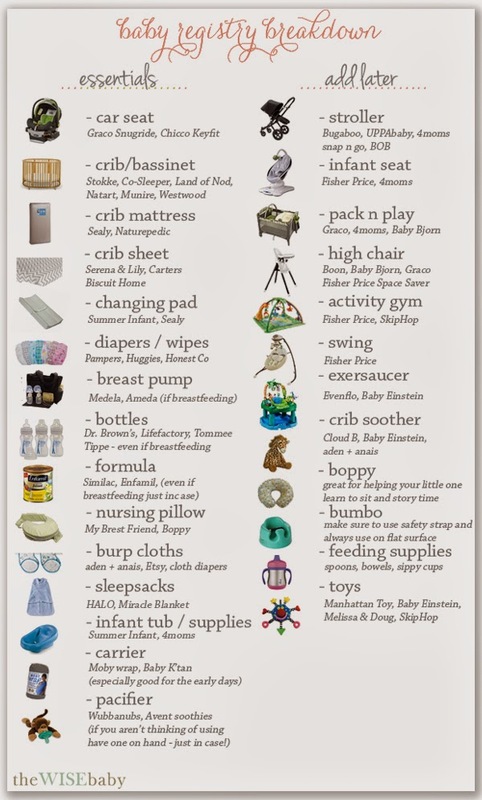 Hopefully you will catch this list before your baby shower but if not, it gives you lots of ideas for what you might want to add down the road too. I found that even though we were gifted and given a lot of hand-me-downs, they didn't all work for us, as parents, or for Charlotte, the baby - a.k.a. user. Every baby is completely different - where one loves to swing the night away, others will scream if you put them near that crazy contraption! This list has given me some food for thought on some changes we might want to make between now and 6 months. For example, I had two breastfeeding pillows when Charlotte was born and neither of them clicked for us so I ended up buying a new Boppy Two-Sided Nursing Pillow and it was a perfect fit for us. Just because someone gives you something, or you buy the "latest and greatest", that doesn't mean it will for sure work for you. If something doesn't work, put it aside for a few weeks and try again. But in the meantime, it's okay to shop - now is the time that you can get away with it - ha ha. Don't settle for being uncomfortable (you or your baby).